One of the greatest things about living in Europe is the ease at which one can travel nearly the entire continents without a car. 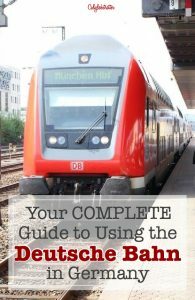 But before you can go and hop on any train, you need to know the ins and outs of using the Deutsche Bahn, Germany’s most powerful train service. You will be hard pressed to find another train in Germany which offers high speed trains throughout the entire country as DB is the ONLY option. 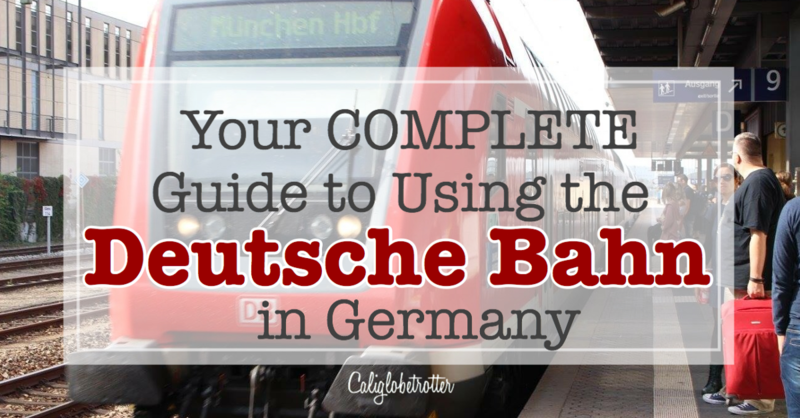 So, please allow me to give you some tips for using the Deutsche Bahn in Germany! 100 Signs You’ve Lived in Germany For Too Long! Learning how to use the Deutsche Bahn can be quite stressful, but having tips from a local on how to use the railways services always helps. 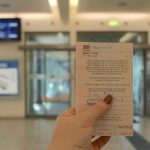 From secret train deals to helpful suggestions, I’ve included a lot of vital information for the German rail system based for beginners on my personal experience as an expat living in Germany. 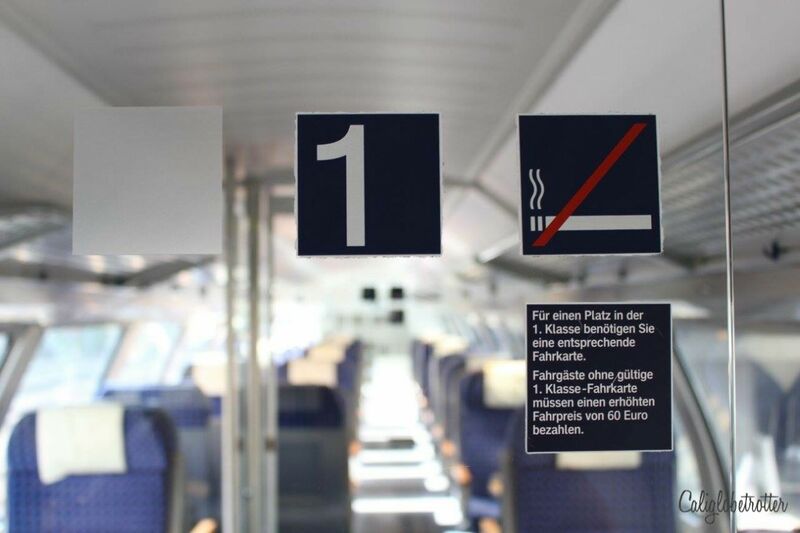 Hopefully, you’ll find these train tips useful and help save you time and money while traveling in Germany! First and foremost, you should know there are two types of trains by which you can travel in and around Germany which are the ICE & RB trains, but there are also variations of the regional trains. The following list excludes all other non-Deutsche Bahn trains. 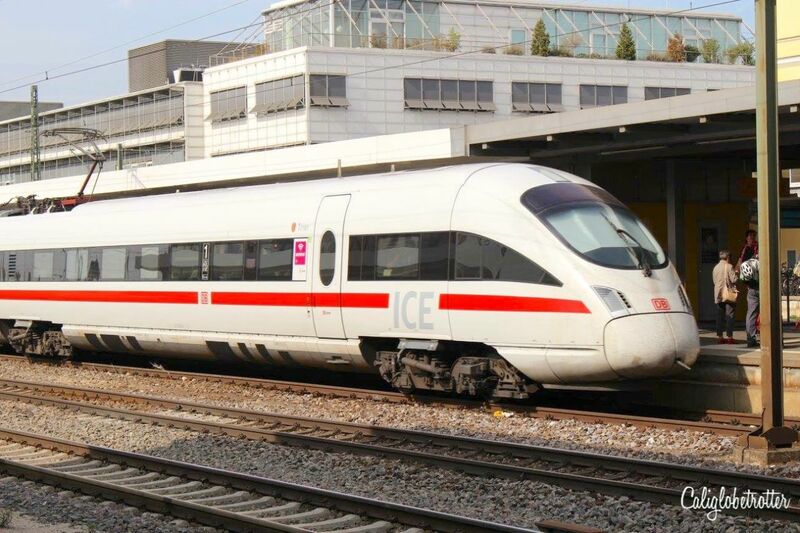 ICE – Germany’s high-speed train and it the fastest and most comfortable way to travel. This is for long distance travel between destinations like Munich to Berlin, Munich to Frankfurt etc. They are also used for traveling to other countries, but you can find more about traveling Europe by train using the Interrail pass or Eurail pass here. Regional Trains – (Regio-DB or RB) slower trains which connect you to smaller cities within Germany and tend to be painted red. These trains are noted by all abbreviations other than “ICE”. RE (Regional Express) lines are for slightly longer distances than the RB. You can travel throughout the entire country using only RE lines, but it will take you a while. RE trains are also painted red. IC (Inter City) trains – IC trains are between the RE and ICE trains. They are typically mostly white with red stripes, like the ICE trains, and they are generally faster than the RE trains. There are three ways in which you can purchase your ticket. You can either head straight for the nearest train station, find a ticket machine or the ticket counter and purchase your ticket, OR you can book online. 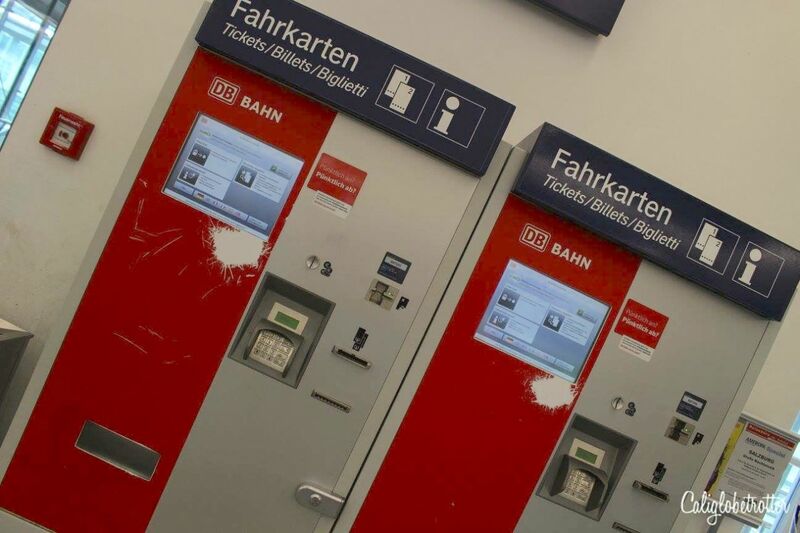 Every train station in Germany has red Deutsche Bahn ticket machines, where you can simply pick your language, choose the date of travel, your destinations and what kind of ticket you would like. Then pay for your ticket and print the schedule and the ticket. Each state in Germany offers a special discount ticket. For example, in Bavaria, that ticket is called the “Bayern Ticket”, which allows up to 5 travelers to ride the rails with one ticket. The ticket is a standard price of 23€ for one person and increases by 5 € per person. Seems like a lot of money, but when you divide the total cost by the number of people in your party, it’s can help making traveling in Germany more affordable! You don’t have to break the bank when using public transportation in Germany! ALL PASSENGERS must sign the ticket! 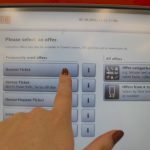 **Hint: If you are traveling alone, look for people standing near the ticket machine asking if you’re headed towards Munich, Nuremberg, Frankfurt or Berlin. Generally these people are looking for people to share a ticket with! 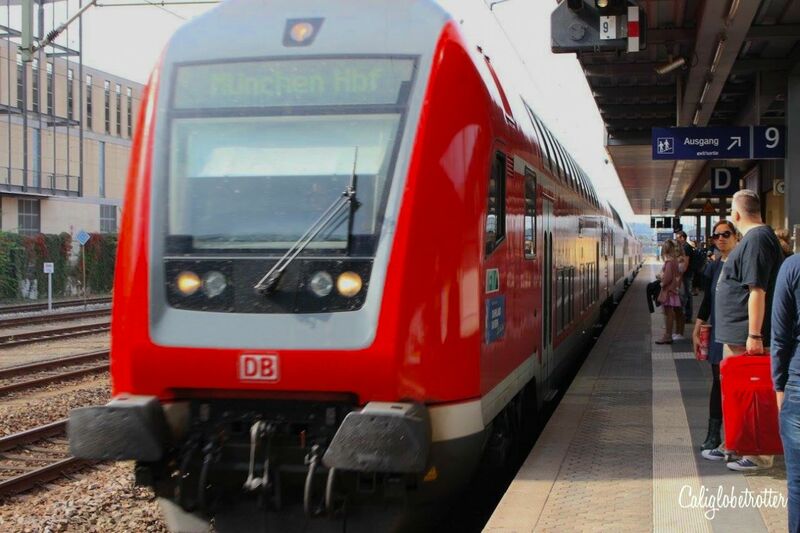 Head on over to Bahn.de, type in your destination, the day and time you prefer to travel, the type of train you prefer to travel with (ICE or Regional) and how many people are in your party. A list of train options will appear and you can check out the different prices, types of trains and changing times. Consider looking for an earlier or later train time to get the best deals (Bayern Ticket excluded).You will first choose your outward journey ticket and if you plan to return to a destination, you’ll click the “return journey” button. 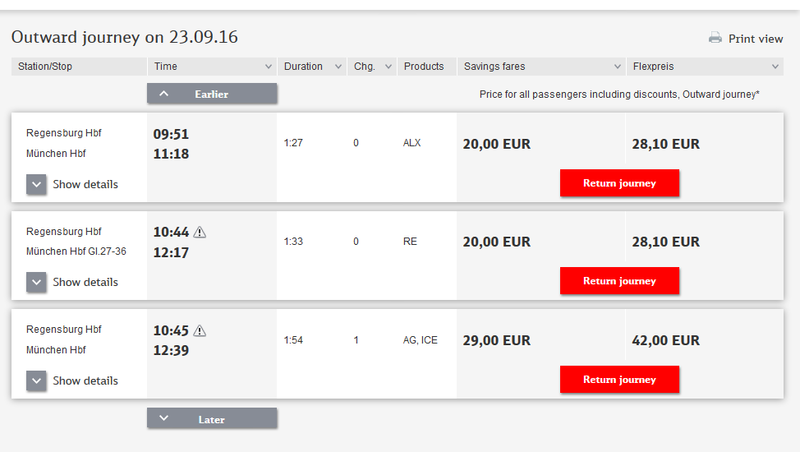 You can make seat reservations for German high-speed (ICE) and night trains with the Deutsche Bahn up to 3 months in advance. You will need a reservation for sleeping accommodation on most night trains. 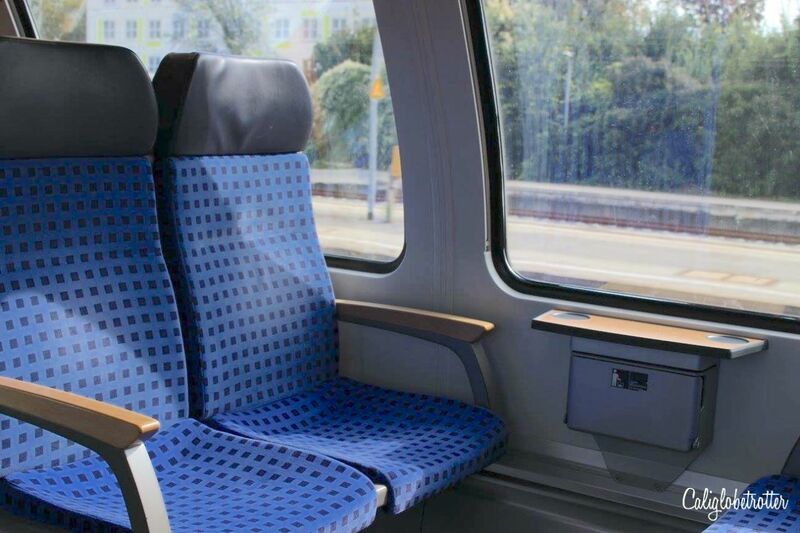 Making a seat reservation for ICE trains are optional, but not required, however, during peak seasons, generally from May to September, it is highly recommended to reserve a seat to ensure you have a seat. Otherwise, you’ll find yourself standing until a free seat opens up. Unfortunately, it is not possible to make an online reservation on trains traveling internationally to and from Germany. For those reservations, you will need to either call the Deutsche Bahn (+49 180 699 6633) or preferably going to an international ticket office located at all larger German train stations. After purchasing your ticket, you can either have the ticket mailed directly to you via Post (for an extra fee), download the ticket yourself and print it or to your phone as a QR code.If you book a ticket online, you will also need to choose how you will be identified on the train when the conductor checks your ticket (which can be your passport or your credit card). You MUST travel with your chosen ID otherwise you risk paying for a new ticket and a fine, or being kicked off the train! The earlier you book, the better the deal you get. CHECK the notification box to receive updates about any changes to your train!! Booking a regular ticket implies that you have a specific time and train, which means you CAN NOT take any train you wish. Should one of your trains be cancelled (which can happen if there are union strikes), the restriction is revoked but you MUST have a train staff member confirm this before embarking on the train. 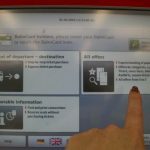 How to Save Money Using the Deutsche Bahn!! We have already discussed the special discount tickets (above). Now it’s time to talk about other ways to save money on the Deutsche Bahn! If you plan to stay in Germany for a couple of months and travel extensively, you should consider the option of a German ‘Bahncard’. There are trial deals for a 3 month period and allows you to save 25% or 50% off the normal ticket price in addition to using local transport in combination with your tickets (only in combination, this is not meant for everyday public transport within cities). You can also consider going the extra mile and purchasing the 3 month trail for the Bahn 100 card, which allows you to “pay once and travel with Deutsche Bahn wherever you like, whenever you like and as often as you like – without having to buy tickets for each trip”. 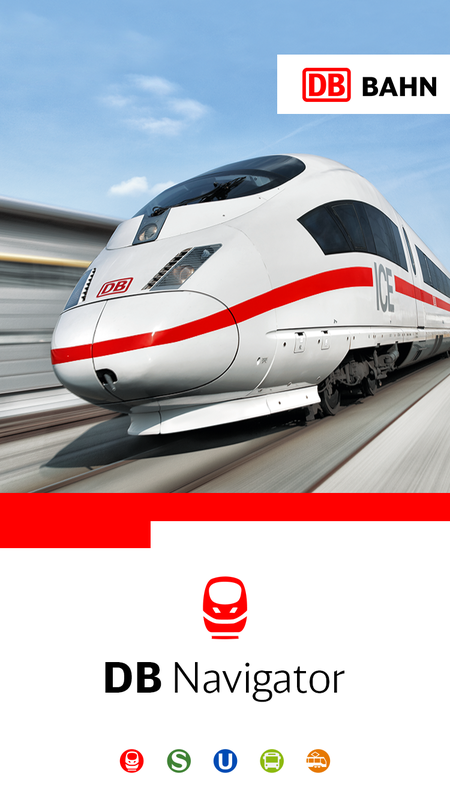 For the most up-to-date info, download the user-friendly Deutsche Bahn App for free. You can search all Deutsche Bahn trains as well as private train times, including buses, U-Bahn (underground) and S-Bahns (Cable Cars). 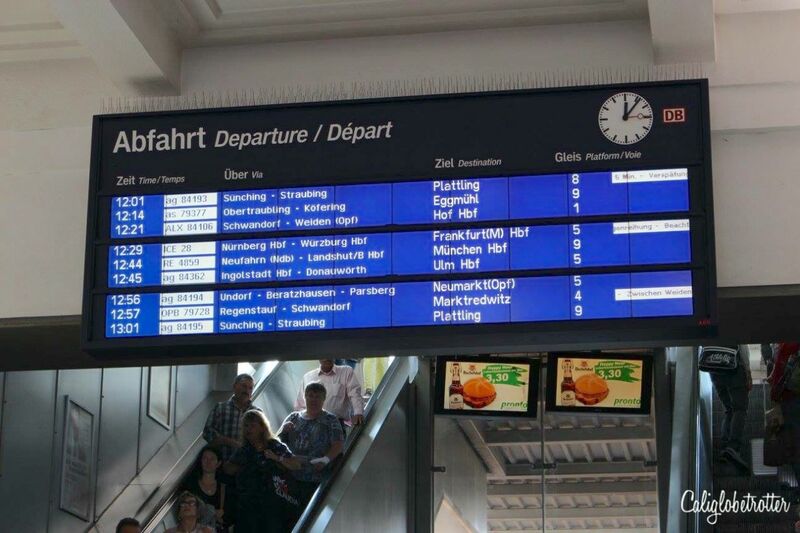 If you’re a first time traveler to Germany, you need to learn about the possibility of your train being cancelled or rearranged due to the reoccurring strikes and protests between the employees of Deutsche Bahn and the company. This is an annual thing which results in many delays and frustrated travelers. Before traveling, be sure to check your wagon arrangement in advance. You can do this by going straight to the train station and looking for the big YELLOW POSTER, next to the train platforms which has the regular schedule of the train. However, should your train be cancelled, looking in advance will not help. If you booked your ticket online and if you checked the box to receive notifications to your email if changes to your train should occur (which you should have done as mentioned above! ), you will receive an email if changes, delays or cancellations have been made regarding your booking! Worst case scenario, head to the train station at least an hour early, check with the Deutsche Bahn help desk and speak to a member of staff who can help you out! Every town and city has a ‘Bahnhof‘ (train station) while in larger cities they have a ‘Hauptbahnhof‘ (Main Train Station). For the smaller Bahnhof stations, they will generally be quite empty and you will be hard pressed to find a member of staff to help you! Should you need help, try finding a local who *might* be able to help you. Otherwise, simply look for TV monitors with updated train info (usually at the platform) or look for the yellow or white posters for schedule plans. For the large Hauptbahnhof, these are generally open 24 hours and finding a member of staff is easy. There will be a big Departures/Arrivals board as soon as you walk into a station with all the most updated train info. 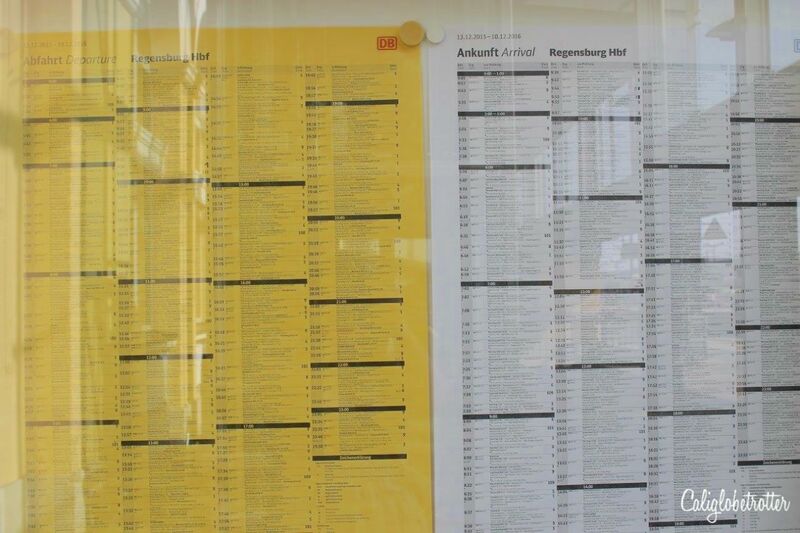 Should your train be delayed, announcements will be made over the microphone, but considering you likely don’t speak German, simply head to your platform or back to the main Departures/Arrivals board and look for a highlighted note at the top of the board. Train Station Vocabulary You Should Know! Once you have reached your platform, look for the compartment you will be seated on. If you bought your ticket and printed it out online, your ticket will tell you which wagon and which seat you will be. If. 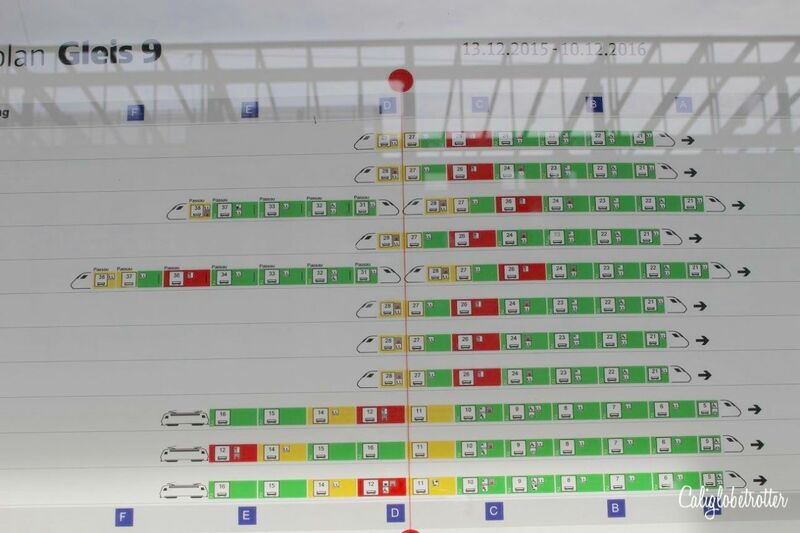 for example, your ticket says that you are in Wagon 23, simply look for the train layout board, which will tell you exactly how your train should look. Then you know to go to sections A, B, C, D… and so on. (Understanding Your German Train Ticket). The trains are clearly marked with a big 1 or 2 on the outside, as well as before each compartment to indicate which wagons are specifically First Class and Second Class. If you do reserve seats on the ICE train, your seats will be clearly marked on an electronic display above the seat. If the display is blank, there is no active seat reservation and you can sit there. If you will be traveling on the Regional Trains, assigned seating is not possible. So, you can sit wherever you would like in Second Class, UNLESS you specifically bought a ticket to sit in First Class. Let’s admit it, traveling with luggage is the worst part of traveling and trains don’t make it any better. Both regional and ICE trains have *some* overhead space, but this is really only for small bags and suitcases. Large suitcases CAN be squeezed above, but I would ONLY recommend this if there is absolutely no other option. For ICE trains, there is always a luggage compartment/rack where you can stow your luggage, but it is mixed with luggage from other passengers and it is not always visible from your seat in order to keep an eye on your belongings. Store your luggage there at your own risk. However, if you are so lucky to find seats which are not occupied near the entrance doors to the wagon, you can find extra space behind the seats and plop down. I highly recommend this. Otherwise, if the train is not full, you can put your small luggage on the seat next to you and the suitcase in the foot space. If you are on Regional trains, there are no luggage compartments/racks, so you will need to have your luggage on the seat next to you, or if your suitcases are too large, I recommend sitting either in a 4-person section where there is plenty of leg room, if the train is not crowded or head to the bike wagon and sit on a pull down chair where there is plenty of room for your luggage. Try not to book trains that are during high peak hours where people are commuting to/from work, usually between 7-9am and again around 4-6pm. This is when the trains are at their fullest, and many times, STANDING ROOM ONLY! Don’t be surprised if somewhere along the way, if you’re heading to the big cities, you have to stand wherever you can. 5 bloggers like this on caliglobetrotter.wordpress.com! Yes! I really needed this post. 🙂 We’re headed to Germany (Cologne) next week and will likely be using DB. Super useful post. Thank you for sharing on #weekendwanderlust. Oh good! Hope this helps! Have fun! This is great. Germany is high on my list. Great tip on the special discount ticket. Pinning for later! #WeekendWanderlust. I’m hoping that our next European trip will be to Germany. When we go, I know that we will definitely be riding the rails. It’s always a bit nerve-wracking when I’m unfamiliar with a system — and in a foreign language, too — so this guide will be helpful. Glad I can be of service! I know exactly how you feel because getting used to the German system took me a while to get comfortable too! Number one on my husband’s travel wish list is a return to Bavaria – I’ve never been – so this will be helpful when we do. Bookmarking this – thanks for sharing! Hope she can find it useful! Great guide, it is the only way to get around Germany besides renting a car. We spent three weeks exploring the divergent sides of Germany and snapped over 5k in photos! It is truly a beautiful country to visit. Couldn’t agree more!! Sounds like you had a wonderful visit! ?? Headed to Germany for 2nd time, I will be using the rails a lot, just to remind me, I was a bit apprehensive on getting on the train that stopped at the platform I was on, If I remember correctly the destination of the train is above the engine car. And the Train number is beside the door of the car you are getting on? I know it is posted on the platform sign indicating Train number, when it arrives, delay time, etc.. I plan buying a Bayern ticket and traveling the country side of lower Germany. 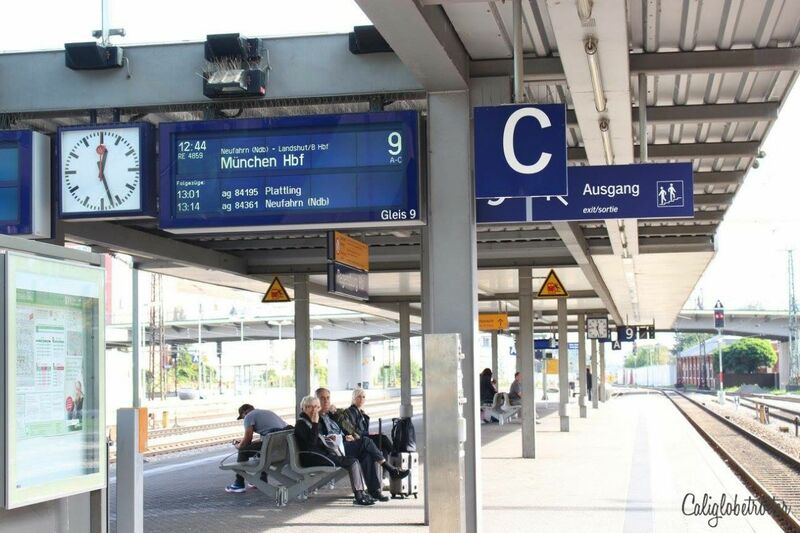 So if you’re worried, just remember if you’re buying a Bayern ticket, even if you get on the wrong regional train, you can hop off and on to another however many times you need. However, train numbers are always on the platform sign and usually on the outside of the train it tells you where it’s going. Have fun!